There are dozens of Independence Day celebrations in the St. Louis area, and one of the most popular in St. Louis County is Community Days in Webster Groves. The family-friendly festival is known for its parade, BBQ, carnival and fireworks displays. Community Days is a four-day event held over the Independence Day holiday. In 2017, Community Days is July 1 from 11 a.m. to 11 p.m., July 2 from 2 p.m. to 11 p.m., July 3 from 5 p.m. to 11 p.m., and July 4 from 11 a.m. to 11 p.m. The fairgrounds are located at the Webster Groves School District parking lot (east of Moss Field) and the northern end of Webster Groves Recreation Complex parking lot. That's just south of Interstate 44 at the Elm Avenue exit. Community Days begins on July 1 with a carnival and bar-b-que hosted by the Webster Groves Lions Club. You can fill up on traditional bar-b-que favorites like burgers, pork and ribs. The menu also includes chicken, hot dogs, brats, baked potatoes and corn. Then if you're not too full, take a spin on one of the carnival rides nearby. The carnival and food booths are open all four days of the festival, but if you want to save a little money, you can get a $35 wristband for unlimited rides on July 1, or a $25 wristband for unlimited rides on July 3. There is also free live music each night featuring a variety of local bands and musicians, and the Miss Webster Groves Pageant on July 2 at 7:30 p.m.
On July 4, Community Days kicks off with a parade at 10 a.m. The parade is a traditional patriotic celebration with dozens of floats, marching bands, clowns, cars and more making their way through the heart of Webster Groves. The parade begins near the intersection of Lockwood and Selma Avenue. It travels west on Lockwood to Elm, then south on Elm to Glendale, ending near the park. Crowds line the streets all along the parade route to take in the festivities. It's best to find a spot early to get the best view. See pictures of the Community Days Parade. No Independence Day celebration is complete without fireworks and the Webster Groves displays do not disappoint. There are two evenings of fireworks during Community Days. On July 3, a fireworks spectacular lights up the night beginning at around 9:30 p.m. There is also a fireworks finale display on July 4 at 9:30 p.m. Each fireworks show lasts about 20 minutes. For more on the complete schedule of events, see the Webster Groves website. Parking for Community Days is available at Hixson Middle School just north of Memorial Park. The cost is $10 per vehicle. There is also free parking available at the Webster Groves Recreation Complex off of East Glendale Road. When those lots fill up, there is additional parking at Nerinx Hall High School and the Webster University Parking Garage. A $5 shuttle runs from those parking areas to the fairgrounds. Here are some other things to keep in mind to make your visit to Community Days a successful one. No coolers or outside food and drinks are allowed. Backpacks, bags and purses are allowed, but may be searched by law enforcement officers. Everyone is invited to bring blankets for viewing the fireworks displays, but please don't claim a spot on the grass days in advance. 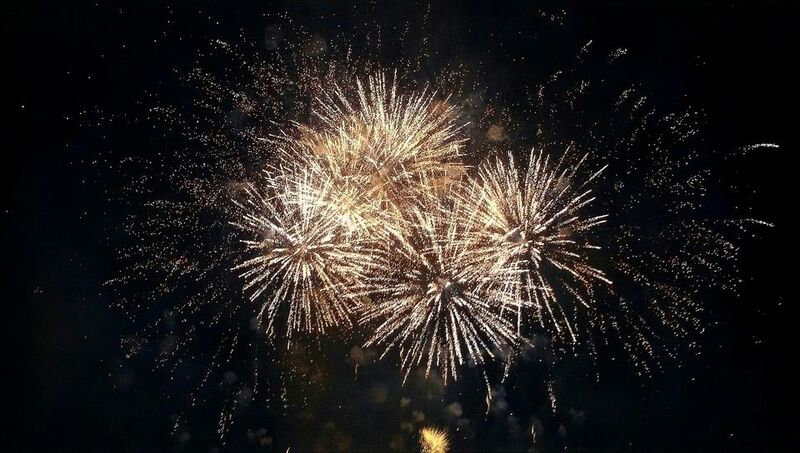 For information on other ways to celebrate Independence Day, see 20 Top July 4th Celebrations in the St. Louis Area or Guide to Fair Saint Louis or The Veiled Prophet Parade.